Before all of the blueberries disappear, I had to get one more summer dessert in. 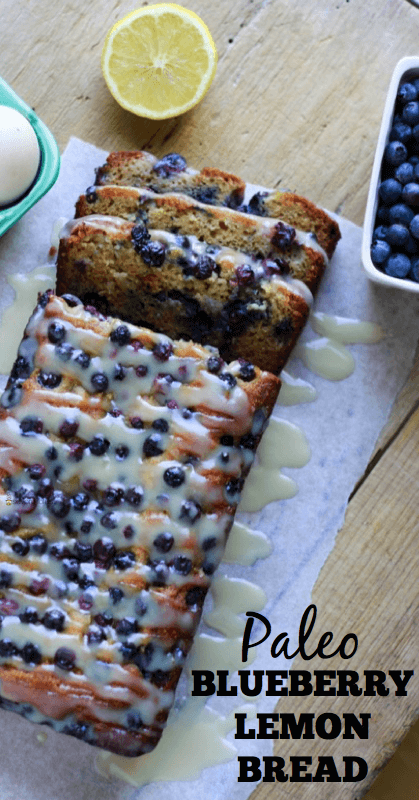 Take a look at this beautiful Paleo Blueberry Lemon Bread. Hi. The recipe looks great and I plan to make it soon. To verify: what size loaf pan? 9×5? Thanks. Yes! That is exactly what I used! Do you know the nutritional value for each loaf? I am going to make this very soon but I have to really watch my calorie intake as well. Thank you. Is this in a 9×5 loaf pan? 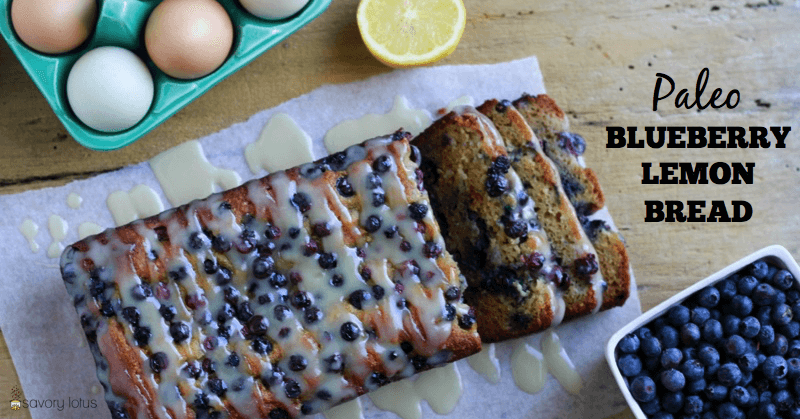 Your recipe for Paleo Blueberry Lemon Bread looks DELICIOUS!! I can’t wait to make it. However, you forget to list the blueberries and quantity needed (a pint?). Please add this to the ingredient list. Thank you for pointing that out. My website crashed this weekend and an older version from a saved version of my site posted. I have fixed the problem. 1 ans 1/2 cups of blueberries. Enjoy! You mention adding hot water to the glaze but you don’t but an amount or mention icing sugar. Do you add icing sugar? I can’t see how it will make a glaze without it. I would definitely make this again. Surprisingly amazing. Had trouble perfecting the glaze but in the end, it still tastes great. Try it! It’s lemony. I was afraid it wouldn’t be. I just made this and found that it weighs a ton… Is that how it’s supposed to be? I forgot to melt the coconut oil so wondering if that is why… It looks delicious though! How did it taste? This is definitely a dense, moist loaf. My family LOVES it. Hope you did too! Hi, Beth! Sorry to hear that you were having difficulty with the bake time. The only thing I can think of is if you used frozen berries that had a lot of liquid in them. I have always made this with fresh berries. I have made this several times with fresh blueberries and it bakes up nicely in about 35 minutes. YOu could always put foil over the top of loaf if it needs extra baking so the top does not burn. I had the same problem & I used fresh blueberries. The taste is delightful, but the center is undercooked. If center is not done, I cover with foil and bake until done. I have found that some ovens do not cook evenly. I am having the same problem. The outside it quite done but the inside is runny. Hmmm. Hi, just wanted to say thanks for this recipe it is fantastic especially considering the low amount of syrup/sweetener used! My husband loves it and requested it a second time which is baking right now. The coconut butter icing is such a great idea too! I used 3 eggs which worked perfectly fine last time, and I added a bit of vanilla, other than that followed recipe! This has been on my list of recipes to try for a while now. I made it last weekend and all of the adults and kids loved it. I will definitely make it again and highly recommend it. Hi, Donna! Thanks so much for the kind feedback! So glad you enjoyed it! Just made this & it tastes delicious ? I used frozen berries so I put about 2 tablespoons of loose oats in to soak up any excess water and it worked a treat ? Just made it tonight! Delish. Thanks for sharing. Does it need to be refrigerated to last? This looks delicious!! Does the glaze harden enough to use on donuts? I am the only person I’ve ever heard of that is allergic to coconut! So . . . . I am very leery to try this recipe. Has anyone out there tried it without all of the coconut ingredients? I presume that lends a lot of flavor to the bread, Let me know! I would love to try this and make it as a couple of gifts but before I risk life and health, I’d like to hear from anyone who has other products in placed of the coconut products! Hi, Suzanne! Sorry to hear about your allergy. I know what it is like to have food restrictions. Unfortunately, I have not made this without the coconut products. You can definitely experiment with omitting the coconut flour and adding either arrowroot or more almond flour. Use butter or ghee instead of coconut oil. I cannot guarantee that it will be the same. But do let me know if you try it. I love to hear about substitutions. So, I made this yesterday and it was amazing!, but do you know how many carbs it has?.. I haven’t tried freezing it. It never lasts that long at our house. 🙂 Please let me know if you try it. I don’t have coconut butter for the glaze, is there something I could use instead? Hi, Jelena! I haven’t made it in a springform pan, but I bet it would be just fine. Yu will have to adjust the baking time. My guess is that it will be less. Let me know how it turns out! Do you have nutritional content info? Thank you – it’s delicious! Well, I followed the directions to a T. It fell apart. It’s delicious, but I was unable to make a real loaf. Any ideas? Hi, there! What I am learning is that different brands of almond flour and coconut flour behave differently. I use the Honeyville extra fine almond flour. And the Nutiva coconut flour. Many coconut flours have different rates of absorbancy, so that may be the issue. I have made this several times, and it always cooks up nicely. 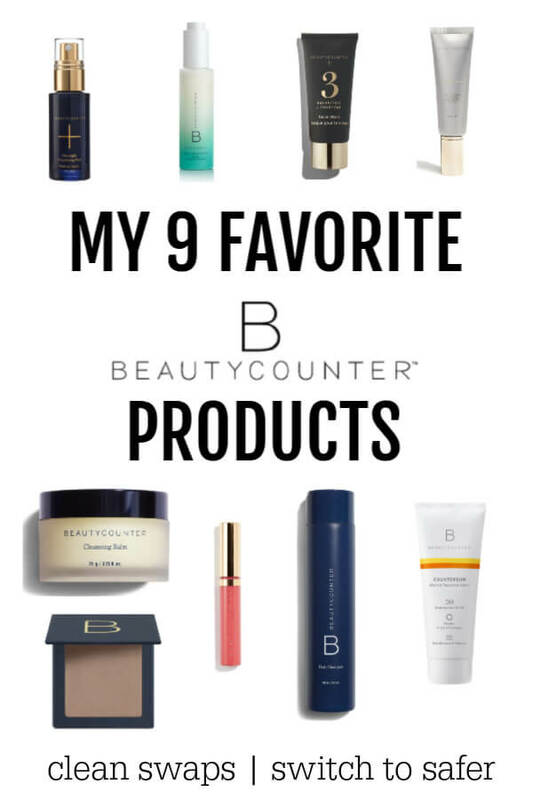 Wondering what brands you are using??? And maybe adding a tablespoon or so of coconut flour if the batter is super runny. Hope that helps. Thanks so much for this recipe! I have made this a couple of times now and my family LOVES it. I am new to gluten free baking so it’s nice to have a recipe that I can trust. Hi, looks so yummy! I do not have blueberries but have dark chocolate chips. Do you think that would work? 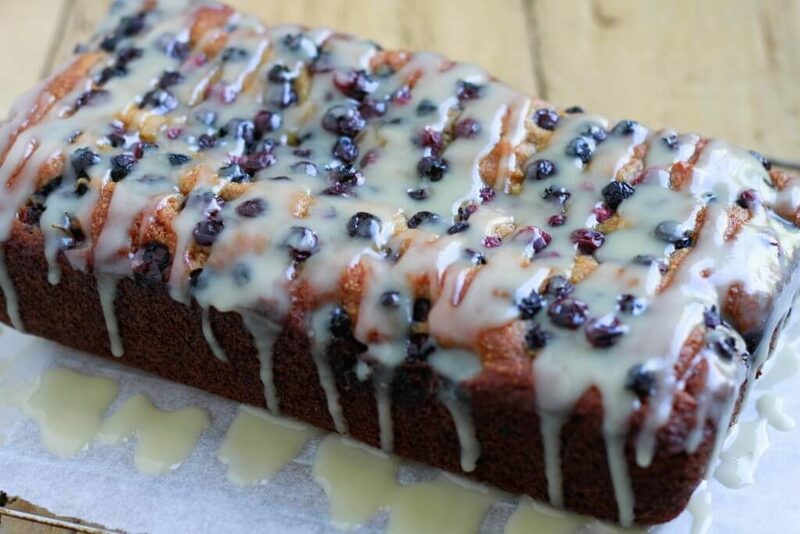 The blueberries add a certain texture and moisture to this loaf that really works. I am sure that chocolate chips will be amazing, but I can’t promise that the consistency will be exactly the same. 🙂 Please let me know if you try it. This is a delicious recipe!! The first time I made it I used frozen blueberries. It came out way too wet. But my husband loved it anyway. The second time I used large, fresh blueberries. I too had a hard time getting it to cook through. The middle stayed really wet. I don’t know the total time because I just kept adding 2-5 minutes on, and checking it each time. But I will definitely make this again. Thank you for this recipe! There’s no icon to print this? Or am I missing it? What a blessing! I made this today for my little girls birthday! It was so moist and delicious! I decided to bake it in a bunt pan and it turned out beautiful! I think it took 8-10 minutes longer to bake. Thank you for sharing this recipe! FANTASTIC!!!! I did some substitutions but the outcome was delicious. Instead of maple sugar or honey, I used Agave (lower glycemic index). I also made muffins with your recipe. Yield: 15-16 average size muffins. Bake time: 18-20 minutes at 350. I love messing with good recipes. Now I’m pondering other substitutions for your amazing recipe. Keep up the good work!!! I made this twice this weekend. The first was a trial run, the second for a breakfast that I hosted. I used a 9X9 square pan rather than a loaf pan. It only took 30 min to bake. The second time I sifted all of my dry ingredients and I used frozen blueberries which I had strained overnight to get extra liquid out. It was absolutely delicious! Hi, Tami! I am so glad that you liked it. And thanks for taking the time to leave your feedback. Have a sweet day! Tami, what effect did the sifting have on the bread? Did it end up fluffier? Made this tonight. It was amazing! Followed the recipe except I used half honey half maple syrup. YUM!!!! WHOLE FAMILY LOVE IT! Hi, this recipe looks delicious. Can I substitute dry wild blueberries instead of fresh or frozen. Do you mean dehydrated blueberries? If so, I don’t think it would be very moist. If you mean just wild blueberries that are a bit more dry then regular blueberries, then yes. But it may not be as moist either. Hope that helps. Stupid question? Why do you grease the pan and put parchment paper down? And should the paper cover the entire loaf? Any thoughts on the best egg substitute? Honestly, I have not experimented much with egg replacements and grain free flours. I find the the egg makes it so much easier to bake. Would love to hear if you do try. I know many folks don’t do eggs. It’s delicious, though, and I’ll certainly make it again. This is very delicious and easy to make. Thanks, Katja! Yay! So glad you enjoyed it! Thanks for taking time to leave your feedback! Delicious! Didn’t have coconut butter, so I left it out and used raw honey and a little tapioca flour for thickness. Also didn’t have a lemon, but orange worked great. Thanks so much for sharing. Orange glaze sounds so good on this! I’m going to have to try this. I can’t wait to try this! However, I cannot consume eggs, do you think flax eggs could work well as a substitute for the real eggs? Thanks! Hi, Lindsey! I do not have a lot of experience with flax eggs and coconut flour. I fond that coconut flour really “likes” eggs. Would love to hear other peoples’ thoughts. 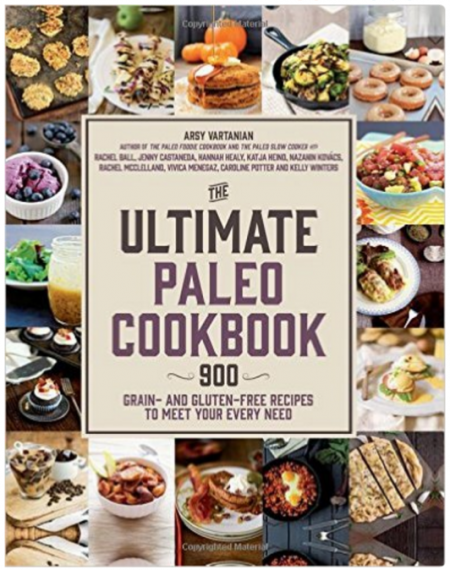 I don’t know much about paleo but am looking for a low glycemic index recipe I can bring to a sick friend who can’t currently eat things that are high glycemic. Does paleo generally mean low glycemic index due to the high protein content and do you think this recipe would qualify as low glycemic? You may not know but I thought I would ask as I would love to make this for my friend, it looks delicious and so healthy! Thank you! I’ve had this in oven for 45 mins and still not cooked in middle ? If your oven is taking longer, you can cover with a bit of tin foil to keep it from browning too much. Followed all the directions. Sadly this was raw dough in the entire center after baking for 36 minutes even though the toothpick test was good. I’ll try lower temperature for longer time if I try this recipe again. Yum! Made this today. I have trouble with getting the center cooked with most bread recipes I try. So, preemptively, I made this as muffins and cooked at the same temp for about 25 min. Turned out wonderful! This bread is delicious and so easy. It did take mine about 52 minutes to get done in the middle though. I will definitely make this again. Thank you! So yummy!? This lemon bread looks very delicious, I will definitely try to cook this at home. Thank you for sharing this amazing recipe with us. Thanks for this wonderful recipe! I used frozen blueberries instead of fresh and it worked fine, I did have to cook it for a lot longer though. Really yummy! So good! I had all but given up on gf/grain free baking and after reading the comments for this recipe, I thought I would give gf baking yet another try. Success! This really is tasty. I omitted the icing and served it as a breakfast cake and it was perfect. Bravo! Oh, that makes me so happy. I love it! Hi guys!! I have made this before and it is amazing!!!! But I remember I substituted lemon essential oil for the zest or maybe for the lemon juice. But I am having trouble finding how I substituted it. Anyone tried that before? Do you know how many carbs and fiber are in this or a piece? Really love this recipe! The coconut butter icing is the perfect topping. I’m excited to try this recipe but can’t use coconut flour or oil. I’m comfortable substituting olive oil but I’m not sure what to do about the flour. Would you recommend increasing the almond flour or arrowroot flour? Or substituting an alternative flour? Wow- talk about delicious! The loaf turned out amazing. I had to bake it 10-15 minutes over (my oven is a little funky), and didn’t put the glaze on top, which I’m sure is a lovely addition but it’s delicious without, too. I’ll definitely be making it again! Hi Katja, what a lovely recipe. I would love to make it but cannot have arrowroot or tapioca flour or starches. Is it possible to increase any of the nut flours in placement of the arrowroot? Thank you! Hi Katja, your recipe looks lovely but I cannot have arrowroot, tapioca or any starches. Is it possible to increase the nut flours in place of this? Hi, Joyce! Yes, you can just sub more almond flour for the starch. Hope you enjoy! 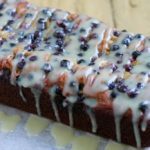 I’ve just baked your delicious Blueberry – Lemon bread and it turned out great, very moist and yummy. My grade for it is almost 10.😊😋(didn’t rise up much, onle bout an inch ☹️). Hi, Gina! I’m not exactly sure what you are asking. If you only used 1/2 cup of almond flour instead of the 1 and 1/2 called for in the recipe, the loaf will be much smaller. Just made this bread and couldn’t wait to try a bite! It was absolutely FANTASTIC! I used honey in the bread and maple syrup in the glaze. Oh so good! Next time, I may try using strawberries! Thank you, this is the best GF recipe I have ever tried!! Delish! Oh my gosh! Made this this afternoon and SO DELICIOUS! My hubs even tried it and loved it! Just enough sweet! I couldn’t get my hands on coconut butter, so I didn’t do the glaze. I’ll have to add that next time! This looks so good! Once spring is here, all I want are lemon and blueberry treats! Can’t wait to try this! Thanks! I’m the same way. Bring on the berries!